Never wash your car when the surface is hot from being in the sun. Always wash your car in the shade. Wash your car frequently. Dirt is abrasive and can scratch the paint if it is not removed. Air pollution or acid rain may damage the paint and trim through chemical action if pollutants are allowed to remain in contact with the surface. If you live near the ocean or in an area where road salts or dust control chemicals are used, you should pay particular attention to the underside of the car. Start by rinsing the car to remove dust and loose dirt. In winter, or if you have driven through mud or muddy water, be sure to thoroughly clean the underside as well. Use a hard direct stream of water to remove accumulations of mud or corrosive materials. 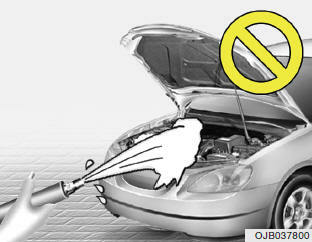 Use a good quality car-washing solution and follow the manufacturer's directions on the package. These are available at your Hyundai dealer or auto parts outlet. Don't use strong household detergents, gasoline, strong solvents or abrasive cleaning powders as these may damage the finish. Use a clean sponge or cloth, rinse it frequently and don't damage the finish by rubbing too hard. For stubborn spots, dampen them frequently and remove them a little at a time. To clean whitewall tires, use a stiff brush or soap-impregnated steel-wool scouring pad. To clean plastic wheel covers, use a clean sponge or soft cloth and water. To clean cast aluminum alloy wheels, use a mild soap or neutral detergent. Do not use abrasive cleaners. Protect the bare-metal surfaces by cleaning, polishing and waxing. Because aluminum is subject to corrosion, be sure to give aluminum alloy wheels special attention in winter. If you drive on salted roads, clean the wheels thoroughly afterwards. After washing, be sure to rinse thoroughly. If soapy water dries on the finish, streaking will result. When the weather is warm and the humidity low, you may find it necessary to rinse each section immediately after washing to avoid streaking. After rinsing, dry the car using a damp chamois or soft, absorbent cloth. The reason for drying the car is to remove water from the car so it will dry without water spots. Don't rub, this can damage the finish. If you find any nicks or scratches in the paint, use touch-up paint to cover them to prevent corrosion. To protect the paintwork of the car against corrosion, you must clean your Hyundai (at least once a month). Give special attention to the removal of salt, mud and other substances on the underside of the splashboards of the car. Make sure that the outlets and the underside of the doors are open. Paint damage can be caused by small accumulation of tar, industrial precipitation, tree resin, insects and bird droppings, when not removed immediately. If water alone is not strong enough to remove the accumulated dirt, use a mild car washing solution. Be sure to rinse the surface after washing to remove the solution. Never allow the solution to dry on the painted surfaces. o Do not use strong soap, chemical detergents or hot water, and do not wash the vehicle in direct sunlight or when the body of the vehicle is warm. o Be careful when washing the side windows of your vehicle. Especially, with high-pressure water, water may leak through the windows and wet the interior. o To prevent damage to the plastic parts, do not clean with chemical solvents or strong detergents. o Water washing in the engine compartment including high pressure water washing may cause the failure of electrical circuits located in the engine compartment. o Never allow water or other liquids to come in contact with electrical/electronic components inside the vehicle as this may damage them.